Greater Heights Baptist Church concert 2nd Chance Ministries will be in concert at Greater Heights Baptist Church, 3304 W Bobo Newsome Highway on January 6th at 6 p.m. Everyone is welcome to come worship with us! Swift Creek Baptist Church schedule Swift Creek Baptist Church, 413 North Center Road, would like to invite everyone to Sunday Bible study at 10 a.m., morning worship at 11 a.m., and Sunday evening at 6 p.m. Wednesday Bible study and prayer begins at 7 p.m. For more information, contact the church office at 843-332-3843. Grace & Mercy Worship Center schedule Pastor Ricky “Sweet” Jenkins and church family at Grace & Mercy Worship Center would like to invite you to come out and worship with them. Sunday morning service at 10:45 a.m., Sunday night service at 6 p.m. and Tuesday night service at 7 p.m. If you don't have a church home, they would love to have you. Come be blessed in Jesus' name. 19723 Hwy. 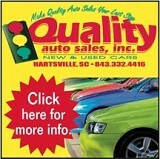 1, Hartsville. If you need more information, contact Pastor Sweet 843-337-5519 or Brother Joseph 843-858-2990. Hartsville Church of God schedule Pastor Patrick Dye and the congregation of the Hartsville Church of God would like to invite you to one of their services: Sunday school begins at 10 a.m., morning worship begins at 11 a.m., the Sunday night service begins at 6 p.m. and Wednesday night at 7 p.m. They have a new exciting Kids Church! They look forward to seeing you! Greenhill Church of God of Prophecy schedule Greenhill Church of God of Prophecy, 3945 Middendorf Rd., Hartsville, invites everyone to their services. Sunday School begins at 10 a.m. followed by worship at 11 a.m. Sunday night youth begins at 5 p.m. and the Sunday night worship service begins at 6 p.m. Wednesday night service begins at 7 p.m. Praise The Lord Ministries schedule Pastor Randy Freeman and the congregation of Praise The Lord Ministries, 824 West Old Camden Road, would like to invite you to attend services each week. Sunday school is at 10 a.m. Worship service is at 11 a.m. Sunday night service is at 6 p.m. Wednesday night service is at 7 p.m. Come worship and enjoy the blessings of the Lord. 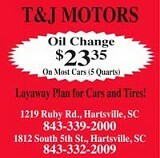 For more information please call 843-861-3581. Centenary United Methodist Church schedule Centenary United Methodist Church located at 830 South Sixth Street invites you to fellowship with them on Sundays. Services start at 11 a.m. and Sunday school at 10 a.m. “Where the Love of Christ fills the Atmosphere” Pastor is Lisa Hawkins. Macedonia Mission Holiness Church schedule Macedonia Mission Holiness Church invites everyone to come worship with them on Sundays at 11 a.m. and Tuesday Bible class at 7:30 p.m. Located at 712 E. Carolina Avenue. Pastor is Kinna Bulloch.